Bleed Eagles Green: Philadelphia Eagles Blog: The Eagles, Sixers, and Phillies: Can Someone Please Make a Move? The Eagles, Sixers, and Phillies: Can Someone Please Make a Move? The Eagles, the Phillies, and now the Sixers. We as Philadelphia fans dream big. When a local team needs improvement we ask for the best. More often than not what we end up getting is disappointment. During the off-season we screamed for a dominant number one receiver to come to the Eagles. And when training camp rolls around this month, none of those players will be in Eagles green. Yes the Eagles did land Asante Samuel, but was the secondary really a major concern? The disappointment continues. Over the past few weeks we have watched our Phillies slump and struggle to hold onto the division lead. The once mighty offense has gone dormant. A similar problem occurred during last year's playoff run. Despite the recent struggles the offense is too powerful not to regain their swagger. However, the key to the Phillies making a post season run is improved pitching. Just ask Jimmy Rollins, "We do need to get some pitching help, there's no doubt about that." If the Phillies need pitching, we as fans again want the best. We don't want Kris Benson. We want C.C. Sabathia, A.J. Burnett, or Erik Bedard. And what will happen come August 1 (after the trade deadline) is most likely a repeat of the Eagles situation. Brett Myers will still be our number two starting pitcher. Again, the disappointment continues. At 12:01am this morning, free agency began in the NBA. To continue their rise in the Eastern Conference, the Sixers need a low-post threat, a dominant power forward. Who better to fill this void and spend our cap money on then Elton Brand or Josh Smith? Late news is that Brand has unexpectedly opted out of his current contract with the Clippers. 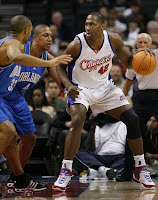 Unfortunately it appears that the Clippers are about to offer Brand a new, more lucrative, long term deal. That’s right, he is going to pick the lowly Clippers over our beloved Sixers. Just pile on the disappointment.